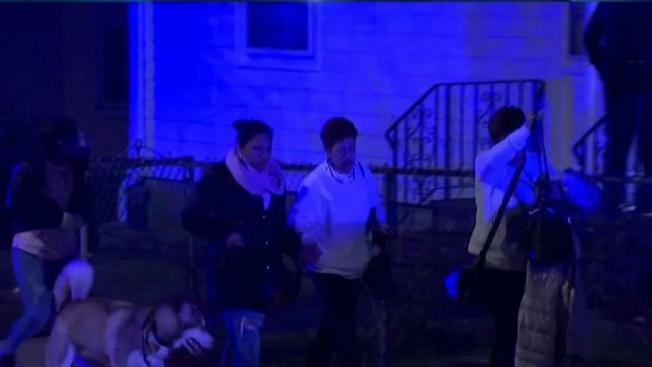 Residents who evacuated the Orient Heights area of East Boston were allowed to return to their homes Friday night after firefighters spent hours battling a massive 9-alarm fire. Boston Fire Commissioner Joseph Finn said three buildings suffered collapses during the fire, which was reported shortly after 3 p.m. at the New England Casket Company on Bennington Street. Crews fought flames and hazardous chemicals while dealing with water supply issues. Heavy flames were knocked down by around 10:30 p.m.
"We got a bit of a handle on the fire," Finn said Friday night. "We have multiple collapses of three buildings. We have some fire that's trapped throughout the three buildings." Heavy fire and smoke were reported throughout the building, Boston Fire said. All fire companies were ordered out of the building and off the roof soon after they arrived at the scene. "The building's in a very dangerous state right now, but we're in pretty good shape," Finn said. "We've allowed residents to go back into their homes. We've been monitoring the air quality since early evening, and it's at acceptable levels for allowing people to go back into their homes." Earlier, police went door to door telling residents to get out. Everyone was out of the building where the fire broke out quickly, and no serious injuries were reported. Finn said two Boston Police officers were transported for smoke inhalation, two Boston firefighters were transported for exhaution, and a Chelsea firefighter suffered a leg injury. Aerial footage from NBC10 Boston's SkyRanger showed firefighters attacking the flames from above with the help of more than a half dozen ladder trucks. Fire officials said as many as 100 firefighters from Boston and neighboring Chelsea were fighting the blaze. They are expected to be there throughout the night and into Saturday. Finn said the structure is one main building connected with other buildings. He said one of the main issues was getting water to the structure. "Our issue was water. And we need pumps. We had us going through a relay operation to get water down to the building so it takes a number of pumps along that circuit to get that moving," said Finn. He added that chemicals inside the building compounded the firefighters' issues. "Our concerned now is there's a bunch of chemicals in the building that are used as lacquers and thinners and things like that that are bringing a concern to us," said Finn. "Grateful for the incredible bravery and hard work of our first responders battling the fire in East Boston," Massachusetts Gov. Charlie Baker said in a tweet. "We will continue to support the Orient Heights neighborhood and all those affected, and we urge residents to respect the guidance & direction of public safety officials." "My heart goes out to our neighbors in East Boston dealing with a terrifying fire this evening," Sen. Elizabeth Warren tweeted. "We're all grateful for our brave @BostonFire firefighters & first responders who put their lives on the line today & every day to keep us safe." "This is for me, is the biggest fire that I've seen as mayor of the city," said Marty Walsh, who was on scene with Finn. "I'm just grateful that no one's hurt. We just want to look out for the well-being of the fire department that's here." The MBTA said Blue Line service was suspended between Orient Heights and Wonderland for eastbound and westbound service at the request of the fire department. Shuttle buses are replacing service in both directions. According to its website, New England Casket Company has been in business in East Boston for 77 years. The current owner, Louis Tobia Jr., is the third generation associated with the company. Gail Lashoto, who said she is Tobia's cousin, lives in East Boston and was at the fire scene on Friday. "It's heartbreaking to see this," she said. "Unfortunately, this is the end result of 77 years of business. It's very, very sad."